Layne Flack is a no limit Hold’em (NLH) genius. He looks at the game a bit differently than the rest of us, and his way of playing works beautifully. You don’t believe me” You say he’s too erratic” Yes, he’s a bit too erratic (in my opinion), but so what. We all wish we had the skill to be that erratic, even if only sometimes. 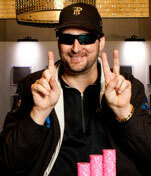 Here is a guy that won two World Series of Poker tournaments this year, both in no limit Hold’em. That hasn’t happened since a certain World Champion did it in 1993 (Phil note: don’t act surprised that I mentioned myself, you already knew I had a big ego!). Mr. Flack just finished second in the Foxwood’s World Poker Tour (WPT) $10,000 buy-in NLH tournament. Also, he has made at least three other WSOP final tables in pot limit or NLH. Did I mention that he spots the field by drinking a couple of six-packs of beers while he plays! Which brings me to the question, does “Drunk Layne” play better no limit Hold’em then “Sober Layne'” Let’s put it this way, I am not scared of anyone in the world at no limit Hold’em, but I have a healthy respect for “Drunk Layne!” When Layne is drinking (it hurts his other games like limit Hold’em, Stud, Omaha 8/b etc…) he is dead on with his reads, and has no fear whatsoever. If he smells weakness, then bam, he moves all-in on you, and you fold shaking your head. It’s hard to beat a guy with great reads and no fear. Here is a hand which happened at the final table at Foxwood’s which shows something: greatness, recklessness or both” With the blinds at $800-$1600, and the antes at $300 a man, Layne limped in with Jd-7d. Andy Bloch limped in with Q-K, and then Jay Colombo raised it $3,400 more in the big blind with Q-Q. Layne called, and then Andy called. Sometimes I take a suited-connector “Flyer” like this myself (Daniel Negreanu style). Anyway, the flop came down 10-9-5 rain bow, and Jay bet only $7,000 on the flop. Now Layne called, and Andy folded–strange that Layne called with merely the second-best-possible belly-buster, and Andy folded with a better belly-buster and two over cards. Anyway, the next card off was a Q, and now Jay bet only $12,000 (obviously, he didn’t want to lose Layne in case Layne was drawing dead). With over $30,000 in the pot, a now open-ended straight draw, and, I’m sure, a plan to bluff in case he missed his draw, Layne called. The last card off was a K, and now Jay bet his last $37,000; and Layne called with his now made straight (the board was now 10-9-5-Q-K). As far as Layne played the hand, I can understand his $3,400 call before the flop, because the raise was so small. His $7,000 call after the flop was a lot harder to make, but he was probably thinking that he could bluff Jay out if he didn’t hit his hand. On fourth-street, he had to call the $12,000 bet. As far as how Jay played the hand. Hmm…I don’t like the small raise before the flop too much, but it’s OK. Jay has to understand that he’s pricing in a very dangerous player when he only raises $3,400 more. I would have to have bet more on the flop, or just checked my hand. Think of this scenario, Jay checks, Layne checks, and now Andy checks or bets, either way, Jay gets Andy hooked in there for something. (Jay either check raises Layne or Andy on the flop and wins it, or Andy hits top pair on fourth-street and gets hooked into the pot.) On fourth-street, I would have had to bet the size of the pot or all of my chips, or check. If Jay checks, then he can check raise Layne out of the hand; or get Layne to bet all of his chips when he is in bad shape. If they both check, then Jay doesn’t have to lose all of his chips on the end when the straight hits. I really hate Jay’s bet of $37,000 on the end here. I just don’t think that Layne would call him with anything but a straight at this point in the hand. I think that Jay should check on the end, or bet a little bit. By the way, I’m not saying that Jay should fold when Layne bets all-in, or raises all-in on the end. Jay may well have too go broke on this hand anyway, but not by betting all-in. You just don’t see too many hands like this come up, especially not at a final table. Playing the Jd-7d before the flop and on the flop like this is a very risky play, and it takes a great champion like Layne–and a lot of luck–to make it pay off big. Make no mistake about it though, Layne played the hand for two reasons; first, to hit it and win big; and second, he was bluffing big if he had too! I hope that everyone enjoyed this weeks Hand of the Week. Good luck playing your hands this week.